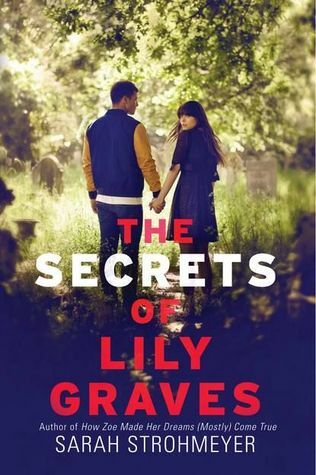 I love me some mystery books and The Secrets of Lily Graves is one of those novels that kept me turning pages and wondering who the killer could possibly be. After being attacked in a graveyard by her long time hater, Erin Donohue, Erin is found dead. Originally Erin’s death is viewed as a suicide but as more clues come to light Erin’s death is found to be a murder. Immediately fingers are pointed at Erin’s boyfriend Matt Houser and even Lily is looked at as a suspect. I liked Lily. She was unapologetically goth, she wears black everyday and likes to study history because everyone’s dead. Lily’s family runs the local funeral home and lives there. Her aunt Boo is a tattooed hair dresser/embalmer. And even her grandmother gets in on the action. There is a just a fun, albeit a little morbid, aura that surrounds her. Matt was also someone I liked despite my better judgment. I was never really certain if I could trust him or not. He is accused of killing his ex-girlfriend Erin and was a bit of a liar so it made it hard to trust him. But I did like the way he stuck up for Lily and the glimpses we got in to Matt and Lily’s shared history. My favorite part of this story though was definitely the mystery. I had a lot of theories about who killed Erin but none of them were right. It was fun to solve things right along with Lily and to watch the relationship between her and Matt evolve. Overall, The Secrets of Lily Graves was a fun mystery that had me turning pages. I liked the characters, the romance, and the mystery. This is my first Sarah Strohmeyer novel but it definitely won’t be my last! Sounds interesting, I love mysteries! !